Laura Allen gives an intimate tour of a home-built composting toilet in her Bay Area urban home. The nutrient-rich composted “humanure” is used to enrich the lush, edible landscape, and doesn’t waste precious drinking water like flush toilets. The co-founder of Greywater Action shows the throne-like toilet compartment whose distinctive feature is a urine diverter. Pee and poop are collected in separate containers beneath the toilet, and are accessed outside the house. Sterile pee is watered in at the base of plants, while poop is collected in barrels and aged for a year or more until it has composted fully. What a way to go! Episode 172. [www.greywateraction.org]. Hi, I am trying to contact Laura Allen about the compost toilet. My house and I built an identical toilet, yet our humanure is too dry (and not composting). If anyone could either give me Laura Allen’s contact info, or some advice on how to make humanure less dry, it would be greatly appreciated! In warmer, drier climates diverting urine may remove too much moisture for the bins to compost into good quality compost. I’ve been composting in Los Angeles now and the humanure in the finished barrels looks more like a darkened version of the sawdust I added (it doesn’t look like soil, though the poop and TP have fully composted/decomposed). To increase the moisture content you could NOT divert urine, and/or use the humanure handbook method of composting in large outdoor bins and combining all your homes vegetable and yard scraps. You may even need to add water/rainwater/greywater if your climate is really dry. Alternatively, you could turn your urine-diverting toilet into a “dry” toilet by adding a mix of lime/ash and soil as the cover material instead of wood shavings. 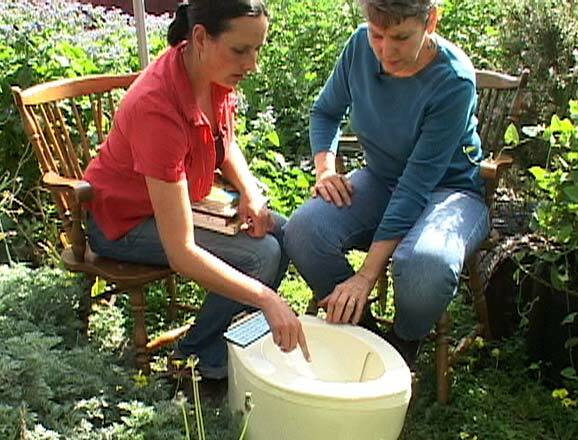 We have more info about dry toilets on Greywater Action’s website. As people embarking on this venture we are reading all we can about it. We have already spoken with the powers that be at the county who informed us they WILL NOT approve this and we’ll have to appeal to other authorities (rolling eyes here). We simply want off grid and to be left the you know what alone. It seems so weird, even obscene that the solutions to such big problems are so simple. “OMG, we are running out of fresh water!” Piss in the garden, poop in bucket. It’s so simple. Thank you, Laura. Moving from “flush and forget” to awareness of entirely new possibilities is our challenge. You have gotten us off to a great start. I talked to a gentleman in Australia who has had a composting toilet in his house now for over 20 years. He says that his house smells sweeter than houses with a conventional flushing toilet. Canada has installed composting toilets in apartments that are several stories tall. Bravo to you. I copied some of the virtues of a composting toilet from Australia, and built it for a house we built in Tijuana. It was labor intensive and expensive for me to build. You have taken a much more eco friendly approach, but I would suggest something different for your pipe that exhausts to the roof. I cannot come up on the 19th, because I will be in Tijuana building another house for a poor family. I will forward your idea to the priests in TJ. I also have a gray water system in the planning/production stage to reuse gray water for showers, washing clothes, cars, garden. I have to pay a lot of money to produce the idea, but hopefully it will be on the market in a few years. This was really worth the wait. It really is a shame that we in the “civilized” world just flush all that valuable manure and urine (and water) down the toilet. I am reading a book “Just Enough” which decribes life in Tokugawa era Japan (1650 to 1850). Night soil was an important resource and farmers would go to the cities to collect it. This also prevented cholera outbreaks that often afflicted Europe. Farmers would even build public toilets along roadways to encourage passers-by to leave a “deposit.” As our petroleum and chemical-based agriculture becomes more and more difficult to sustain, we will have to begin using “humanure” again. Unfortunately, I would have a divorce on my hands if I tried to start such a system in our household.